In additional to cable television, there are a lot of Internet options to find your favorite shows. The problem is figuring out which distributor — among Netflix, Hulu, and Blip.tv, to name a few — carry the single show you’re searching for. TV Guide’s latest major update to its iOS app solves the problem; in addition to TV listings the company’s most recognized for, the app will now show you can watch your favorite show offline and online. The feature known as “Watchlist” will first appear on the iOS platform followed by Android and Windows Phone later this Fall. Watchlist saves the user-selected TV shows, and notifies the user of where they can watch the show on TV, DVD, or even streaming services. For example adding Modern Family to your Watchlist will display your local TV listing. But the online streaming listings, ordered by the episodes, will include for pay options from iTunes, a subscription option from Hulu Plus, or a free to watch option through ABC. The DVD option for Modern Family lists Netflix, although Netflix doesn’t appear as a subscription-based streaming option. An additional perk in this update offers users the ability to add specific actors and actresses to their Watchlist, which will then display relevant online and offline listings where these actors make an appearance. When a user selects a show to watch, it will open up a new window and play the video, or if an app is required to watch the clip, the TV Guide app will redirect the user to the app’s download page in the iTunes store. 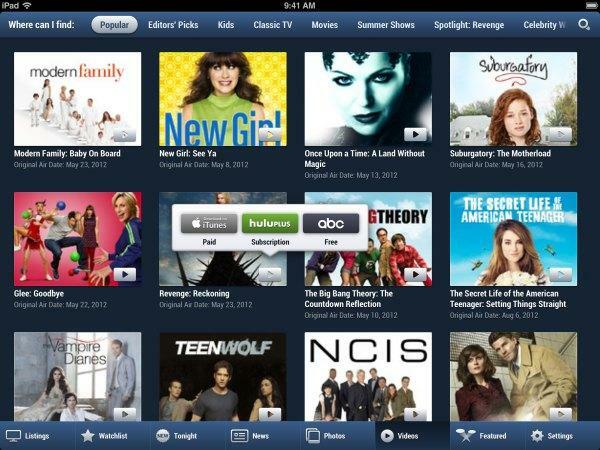 Currently the app supports streaming from ABC, ABC Family, CW, Hulu Plus, HBO Go, Crackle, and iTunes. According to TV Guide, additional sources will be added in the next few weeks. While Watchlist is clearly the star of the update, TV Guide has included various new social features. “New Tonight Trending” shows what other users have indicated they’re going to be watching through an “I’ll Watch” button. Users can then comment or share any of the content that has been selected with the “I’ll Watch” button. TV Guide also delves into the content curation game, which users will find within a button titled, “Videos.” Here, the app lists TV shows, movies, and even Web shows, within various categories including Editors’ Picks, Shira Lazar’s Picks, and Celebrity Watchlists. The app has elements from competitors like GetGlue and Viewdini, but as more streaming channels are included, TV Guide’s latest update emerges as a leading contender and one that we’re inclined to use.